Originally developed by the Nikon Corporation for exclusive use with their digital SLR cameras, the NRW file type is a newer form of RAW image format. Released in August 2008, NRW, or Nikon RaW has many characteristics in common with the original RAW format. Compared to other image file types, the NRW format is a large file because it's saved in a raw, uncompressed state. Although NRW photos allow for modification at high resolution, it makes more sense to save NRW as TIFF (or another small format) to conserve space. Due to the proprietary nature of the NRW format, there are not many image viewers that can open NRW files. Those that can, often only allow you to view NRW files when what's really needed is a conversion tool that will also let you save NRW as JPEG etc. Fortunately such a program exists! With the help of our batch NRW converter you can view, convert, and save NRW into just about any other image format. Convenient, flexible and designed to offer you maximum utility, the Total Image Converter gives you complete control over your NRW image files. Featuring a user-friendly GUI, our program acts as both an NRW viewer and converter! Equipped with batch functionality, you'll be able to automatically process hundreds of images at a time (for example, NRW to JPEG, NRW to TIFF). 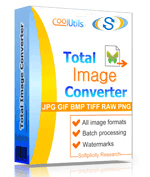 While you're at it, the Total Image Converter lets you enhance your images through a variety of customization options. The experts in conversion software design, our program is backed by 14+ years experience and refined through millions of uses. We're always on the lookout for new formats as they emerge, and developing conversion solutions in response. Get started today by downloading our free trial version and see what a truly cool tool the Total Image Converter can be. When it comes to helping you manage NRW (and all your image files) we are second to none.